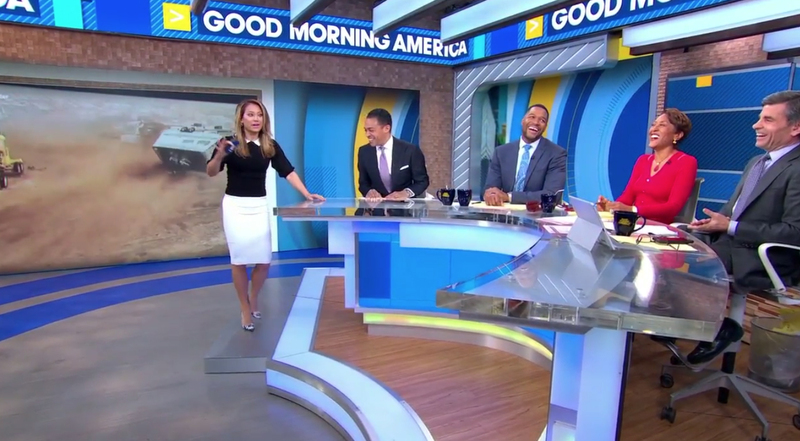 ABC News‘ “Good Morning America” had a good April Fools’ Day trick up its sleeve for its competitors — a new set that ties into the graphics the show debuted earlier this year. The show, designed by Seth Easter, retained its anchor desk, but changed up most of the first floor studio space that it typically uses for the first part of the broadcast — an update that included bringing in numerous new video walls and panels. 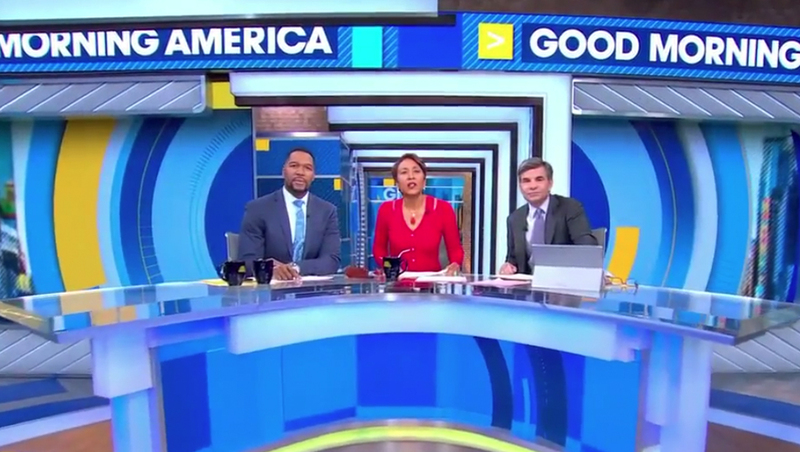 The new home base features the old horseshoe-shaped anchor desk backed with a “hallway” framed by a row of dramatic upside-down L-shaped internally lit structures. Farther back is an additional video wall that appears prominently on air behind the center anchor position. On either side of the opening are additional LED panels partially wrapped in two curved framed with diagonal reveal lines that, thanks to a lighting effect, become glowing lines that echo the diagonal lines in the show’s graphics. The asymmetrical look also includes a “wraparound” video wall segment camera left. The wall appears to continue “down” the hallway, which also includes a circular element ringed by edge-lit segments that mirror the ringed hash marks in the graphics package. Faux brick and metallic elements complete the look. The space, located at Disney’s Times Square Studios, also incorporates walls with small square-shaped wood “tiles” and wood finishes with thin horizontal striping, many of which match the look upstairs. What makes the new home base unique is that, instead of just using a single large video wall, the LED segments are broken up by real scenery — as well as the use of depth — to create a layered, structural look that still gives the show the flexibility to change out backgrounds easily. By combining bold ring graphics that appear to “ripple” out from the portal in the middle of the wall, the look also draws the eye in to the talent. The space also features a larger, more prominent LED ribbon running around the top of most of the set, which mirrors the header elements found on the studio’s second floor. The ceiling of the main set also features internally lit slats suspended from the studio grid. 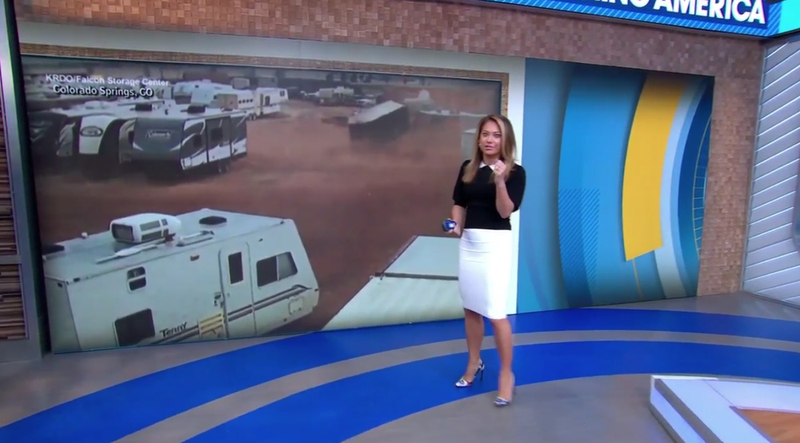 A large span of video wall camera left of home base is used for both weather and general standups, with the option for talent to ‘debrief’ at the anchor desk before walking over to the wall. 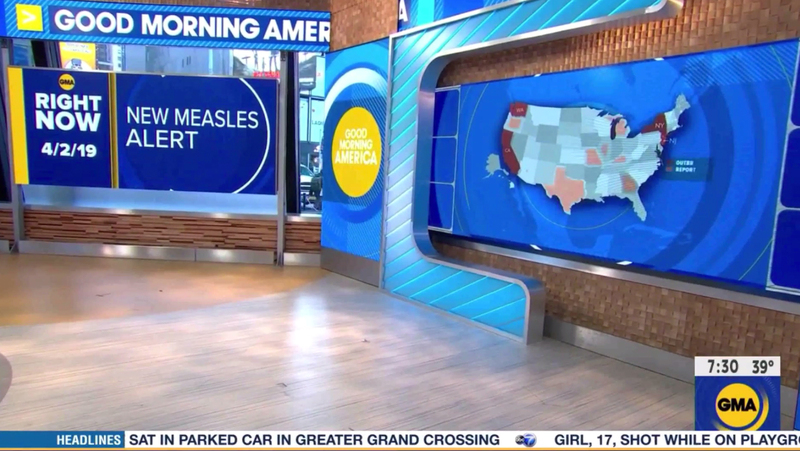 For most segments, only about two thirds of the video wall is used to showcase video clips, topical graphics or weather maps, with the rest of the space filled in with branded graphics and a faux white frame. The set also incorporates a small one-on-one interview area with a round glass table. The space also features the diagonal textured wall, internally lit segments as well as both horizontal and vertical video walls. Many of the vertical video walls are used to display both circular logos and topical OTS-style graphics for in-studio standups. The space features a video panel in front of the space’s windows overlooking Times Square as part of a larger array of video panels and scenic elements that are used for both standups and ‘walk and wander‘ shots during the 7:30 a.m. ‘Right Now’ segment. 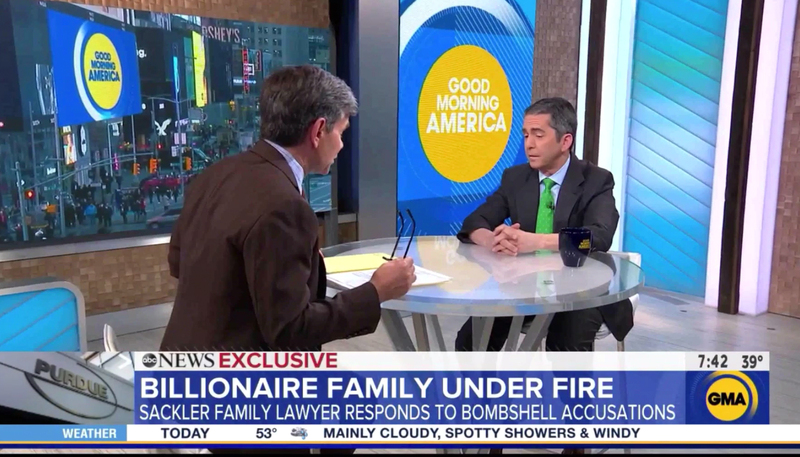 During this segment, the broadcast typically feeds graphics with rounded rectangle accents on the left and right side of the graphics, again adding a more ‘structural’ and layered look to what would normally just be graphics. 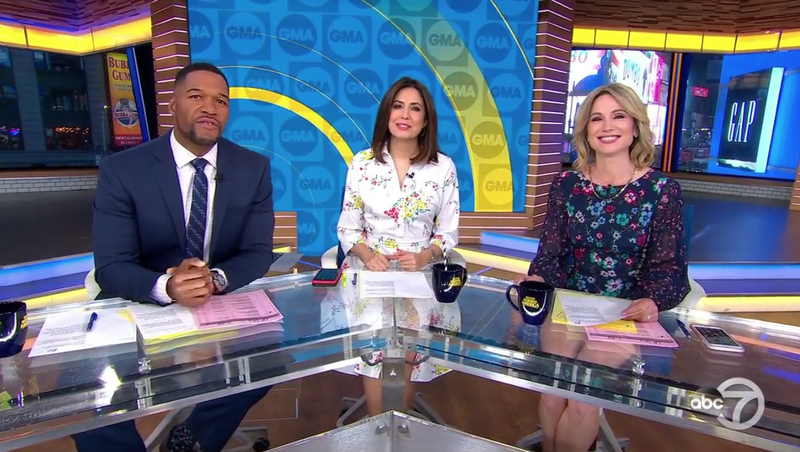 On Friday, March 29, the entire broadcast originated from the second floor of the Times Square Studios, likely meaning renovation work was already underway — and continued over the weekend.